We’re delighted to be welcoming Mark Barrett to Brilliant Things later this month. He will be talking about inclusive approaches to neuro-diversity with Tom Weir. Mark was one of the Museums Association Transformers last year alongside being a trainee at Colchester and Ipswich Museums. 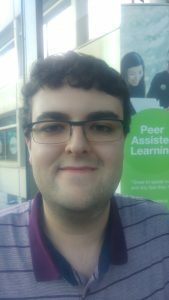 He is currently a student at the University of East Anglia and his work involves advocating for Autism Awareness and Inclusion at the heart of museums.